Welcome to this week’s Weekly Update. On Monday, pupils from Year 6 were invited to Bexhill Library to meet local author, Ross Welford. The children are taking part in this year’s ‘East Sussex Children’s Book Award 2019’. They have to read a selection of stories, written by local authors, before voting on the story that the like the best. The children were invited to meet one of the authors as part of the challenge. They asked Ross about the ideas for his stories and what the life of an author is really like. Ross Welford is the author of ‘1000 Year Old Boy’. This is the first book the children have read…there are four more to go before they can vote! Year 1 had fantastic fun yesterday as they take part in a ‘Jaws and Claws’ workshop. The children had the opportunity to meet lots of animals and insects, some they knew and some that were first encounters. 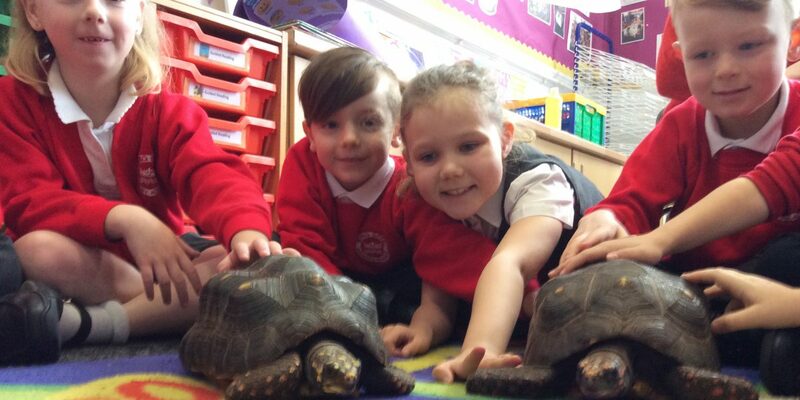 Many children chose to hold and interact with the different animals, which included snakes, tortoises and a very cute baby hedgehog. The children learned about how to care for the animals, the food they eat and where they live. Thank you to all of you who attended one of our Parents’ Evenings this week. It was great to talk to so many of you on your way in or out of your child’s appointment. I hope you found the consultation with your child’s class teacher informative. If you were not able to meet with your child’s class teacher, it’s not too late. Please make an appointment to see them. In the weekly ‘Attendance Raffle’, Lucy J in Year 3 was this week’s winner. Well done, Lucy! In this term’s ‘Attendance Challenge’, Year 1 Turquoise and Year 3 House Martins are top of the leader-boards so far! Frankie E in Year 3 was awarded this week’s ‘Sports Personality’ award for her outstanding achievement in jujitsu. I’m sure she will wear the badge with pride.